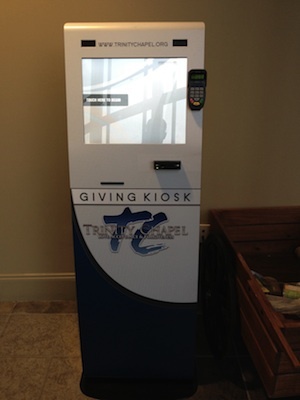 Congregants at the Trinity Chapel in Atlanta, Georgia have a unique means of giving to the mission of their church; a handy giving kiosk. Insert your card, and press the right buttons - your gift to the church is accepted! I wasn't able to get any details from their website; they do appear to offer an impressive array of options for online engagement in their church mission. From Trinity Chapel and Reddit.